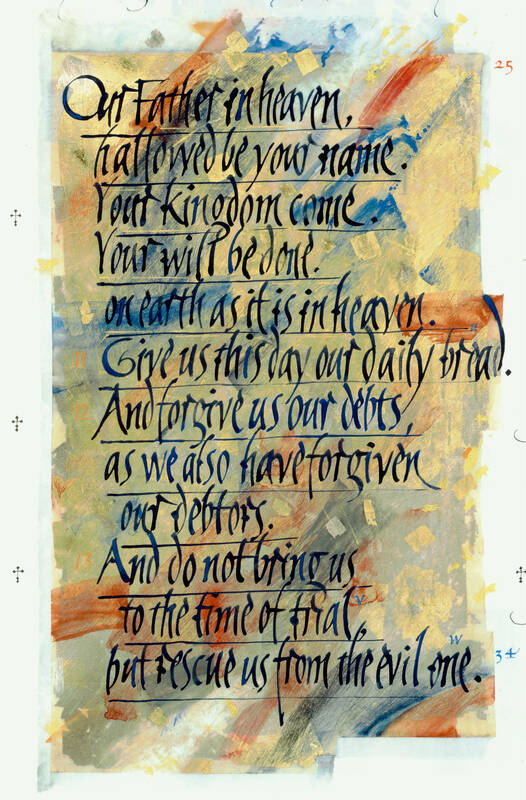 Lord’s Prayer, Donald Jackson, Copyright 2002, The Saint John’s Bible, Saint John’s University, Collegeville, Minnesota USA. Used by permission. All rights reserved. On the first day of Lent, as we receive ashes on our foreheads each year, we take the time to reflect, to remember. We remember we are dust, and to dust we shall return. Today is set aside to reflect on our mortality, so that in turn we may know what is necessary to live and live fully. In his Rule, Saint Benedict writes “day by day remind yourself that you are going to die.” By being mindful in this manner, one can more clearly distinguish what is essential and what is futile, what is healthy and what is harmful. While working in palliative care, Dr. Ira Byock discovered that a few simple phrases are powerful catalysts in bringing resolve to the emotional issues with which humans most commonly grapple. In his book, The Four Things: A Book About Living, he encourages people to say: “I love you,” “Thank you,” “I forgive you,” and “Please forgive me.” Needless to say, two out of these four things involve forgiveness. As humans, we endlessly underestimate the power of forgiveness. Yet it remains a foundational component of our Christian life. We see the importance of forgiveness indicated by its mention in the Lord’s Prayer. In fact, the colors of this illuminated text—blue, red, and gold—speak to just how primary and necessary both forgiving and being forgiven are for our well-being. When we pray primarily in the way that Jesus taught us, an infinite and eternal spectrum of possibilities opens up for us. An intimate relationship with the Lord, a genuine desire for the will of God to manifest more fully on earth, an authentic agreement to work hard for our daily bread while still relying on God to provide for our deepest needs, imploring protection against the deceit of empty promises, and resolving to continually do the work of forgiveness: these are our vital signs as Christians. Just as a painter begins with the primary colors of red, yellow, and blue to mix and achieve the rest of their color scheme, these are the elements of the Christian life that we start with on our palette. By layering these practices over one another, we begin to live vibrantly in the fullness of the reality that God intends for us. In this Year of Mercy and particularly in this season of Lent, I invite you to search your heart for any unforgiveness you are holding onto that impedes you from truly welcoming the tender mercy of the Father. What can you let go of in order to freely allow God’s love to penetrate your inmost being? For what do you need to forgive yourself? What demands or expectations have you placed upon God that you are now willing to release and repent of? Whom do you need to forgive? Can you hand over these burdens to Christ? Forgiving others and asking forgiveness will not determine whether or not we will return to dust; it is inevitable that we all will. Rather our choice to forgive determines whether we say yes to Christ, who summons us and seeks to gather us back to himself as one united body. As we begin our journey in this season of Lent, let us pray that we may be humble and courageous in embracing the power embedded in this beautiful prayer Christ offers to the Father in the presence of the disciples. By remembering our eventual return to dust, may the present begin teeming with the potential to practice love, gratitude, and forgiveness. What opportunities do you have today to begin saying “I love you,” “Thank you,” “I forgive you,” and “Please forgive me”? Will you make the most of them? On the first day of each week of Advent, Seeing the Word will post an illumination paired with an audio reading of the associated Scripture passage. The subsequent days will feature the six movements of visio divina: Listening, Meditating, Seeing, Praying, Contemplating, and Becoming Christ-like. This story is so familiar that it requires effort to hear it with fresh ears. Beautiful nativity scenes and Christmas card images automatically jump to mind. Because of this familiarity, we risk missing the real impact of the story—what it means for the divine Son of God to put on flesh and enter humanity. Our first picture of Jesus is as this tiny baby, and it is tempting to want to leave him there. In the innocence and familiarity of the account of this event, we may forget that if one is born, one also will die. We are also reminded that God is in charge; he works even through corrupt governments who disrupt people’s lives just to get their taxes. The Emperor’s decree brings the birth of the Messiah to the town of Bethlehem, fulfilling scripture. God works through the haughty and the humble alike. We can only imagine the discomfort of Mary as she makes this long trek while expecting a child. This reminds us that when we obey God’s calling, we are not promised an easy journey. But we are promised that everything has meaning and purpose according to God’s will. The world-wide event of taxation reeks of legalism. It starkly contrasts the angel’s world-wide declaration of good news for all the people. In the midst of a human invention, a divine exclamation vibrates in the ears of the universe, reverberating throughout all of history—Jesus Christ is born! The human decree is bland; the angel’s decree is glorious. The glory of the Lord almost acts as another character in the story. At first, it terrifies us. Why? Is it because the closer we get to the glory of the Lord, the more we see our deficiencies, weaknesses and vulnerability? We do not glorify God for his sake but for ours. We glorify God when we recognize that the only one who is worthy of praise knows our name and seeks us out. When that sinks in, our hearts overflow with joy and hope. I wonder if joy and hope aren’t relatives of glory. Each produces the other and all three are due to and because of God. My eye is immediately drawn to the shaft of gold in the center of the illumination. It is a beautiful indicator of the glory of the newborn King. On both sides of this golden vertical shaft, heavenly hosts create a horizontal plane, creating the image of a cross. It seems cruel to acknowledge the cross when we are celebrating new life, but they are intrinsically tied together. The ultimate “new life” we experience through Christ requires us to know the full story, from birth to death to resurrection. I am struck by the prominence of the animals in the scene. The ox is like a black hole that draws my reluctant eye to itself. It seems to mar the glory of the shaft. Yet, could it be that the ox is genuflecting to the manger? My attitude towards its blackness softens as I now see the black ox as the shadow of death bowing to the Christ-child. Could it be that the bull, symbolizing the fake idols we create, is bowing to the only one who deserves to be worshipped? The donkey and sheep have a prominent place in the scene and obvious ties to many references in scripture. The depiction of the shepherds hardly succumbs to conventional images. But all who peer into the manger have a sense of awe on their face. I’m glad the baby Jesus is not depicted but implied. It leaves us room to focus on the mystery and awe of this human-divine event. We climb into your lap and feel your wide embrace enfold us. We rest our heads gently on your chest. Your face turns downward so you can kiss the top of our heads. We settle in, feeling peace, feeling safe, feeling known. You permeate our selves. You are our conscience, our advocate, the transformer of our hearts. Without you we cannot praise or glorify for you reveal the truth to our souls. Course through our souls like the blood that courses through our veins. You are perfect love, perfect community. You have been dancing in perfect harmony for all time. Thank you for inviting humanity into the dance, for leaving a place for us at your table. As you prepare our hearts for the first coming of Christ, keep us ever mindful of the permanent place he desires to have in the manger of our hearts. May all we do be to your glory and be of service to your people. Amen. I feel a very real sense of “coming down” and of “coming into.” As I contemplate the gold shaft piercing through the dark night and landing on the gritty earth, I long for that kind of direct connection with the divine—pure, strong and unhindered. I am reminded that the “coming down” of the shaft is not dependent on anything I do. I had nothing to do with creating it or summoning it. I cannot work my way up to it, and I find peace when I realize I don’t have to. God has come to me. All the faces of the people in the illumination are pointed downward, not upward. To find God, I look down into my heart, not up to some faraway heaven. He resides here, now, with us, within us, between us, and among us. Our faces reflect his glory, just as those who behold him in the illumination reflect the warm glow of the manger. The darkness of night that undoubtedly surrounded the manger also surrounds us, but the light of God has come into the world. The world cannot overcome this light nor does the world understand this light. What an amazing gift to be invited to live in the light of Christ! I am challenged to resist falling into the trap of familiarity with this story or any other passage I know well. What has become so familiar that I gloss over it, thinking I already know what it has to say? The Living Word of God is just that—living. Even in the most familiar passages and stories, I can hear a new word from God. I long to join the angels in their heavenly song, glorifying God. Again, he doesn’t need me to, but I need to; I long to. How do I do that? By carrying his light into a world bathed in darkness. The world is full of judgement and shame. The light of Christ coming into our humanness shatters the notion that we can earn his love. He has come to us. We want to do good works because we recognize this love we’ve been shown, not because we think they will somehow save us. Let all I do be for the glory of God. Remind me that God is Creator and I am the created; he is the redeemer, I am the redeemed. It cost me nothing but it cost God everything. As I come closer to his light, I see my fallen-ness more clearly. I am humbled as I recognize my need for this gift freely given. How can I judge another? For we all fall short. Glory to God in the highest! Laurie E. Neill is a pastor at First Lutheran Church in Fargo, ND. She graduated from Luther Seminary in St. Paul, MN in 2012. Prior to ordination, she worked as a lay pastor at The Lutheran Church of Christ the King in Moorhead, MN. She became “hooked” on The Saint John’s Bible during the Praying with Imagination retreat this past summer. “In the beginning…” This first line of the Gospel of John may have you wondering if you are reading Genesis. Here is a stand up, pay attention phrase, shared to introduce an important event. The incarnation story unfolds right before our eyes. At the center of this passage is the everlasting gift of light that overpowers darkness. John the Baptist co-stars as a staunch herald of the power of this light. He bears witness to the incarnation and the Word, who becomes flesh and lives among us in the person of Jesus. This reading from the Gospel of John offers a dichotomy, that even today, is both confounding and hopeful. Some of God’s own creations do not accept or recognize Him. Nevertheless, day after day God continues to offer the opportunity for all to become God’s faithful children. This week let us recognize that we were uniquely fashioned by God. Let us claim this truth and cling to the Lord’s light, which overcomes darkness. Let us look forward to basking in the warmth of the Christmas story that reveals the incarnation. Imagine the miracle: The Word breathed life, and the world came into being. The Word became a living being—a true light illuminating our very existence. Experiencing times of anxiety, fear, and loneliness is part of the human condition. These feelings can erode us, leaving empty holes that can so easily be filled with darkness. But there is always an alternative! Words are powerful; a caring and compassionate word can pull us out of an unbearable situation into a place of light and peace. Jesus was famous for His healing words. Remember the story of the Centurion asking Jesus to heal his sick servant? Jesus responded, saying, “Only say the word and my servant will be healed” (Matt 8:8). So it was in the beginning. The Word created a new earth filled with life and light, where His grace and truth prevail. It is striking that this combination of grace and truth does not appeal to all people. Sometimes we reject it. Personally, when I choose to act in darkness rather than light, a shadow hangs over me and drains my spirit. However, the Word has come to open the gate where light and life flow back to me and set me free. Positive changes are possible for all of us when the Word becomes deeply seeded in our hearts. The Word is so much more than a word. The Word is life itself. May our words model the grace and truth that Jesus has offered us and be a source of ongoing life for others and this world. The illumination of the incarnate golden Christ beckons. Christ, standing against the cosmos, is solid, yet delicate. This is an ideal prelude for the birth of Jesus. A dying star hangs at the top of the illumination. Millions of years later, after this star morphs into a black hole, the earth will still receive its light. So too with Jesus, though his physical body is gone, he remains a brilliant source of life and light for us even today. The Lord’s presence, symbolized by gold in The Saint John’s Bible, is bold. It is hard to take my eyes off of the sparkly figure. It is a stunning, yet haunting illumination. I am taken with his transparency and causal stance. Where are his hands and feet? Jesus seems to open himself to us in the illumination. I wish I could see his face. I want to talk to him. I wonder why Jesus is so transparent. I want to touch him. I want Jesus to stay but it looks as if he is on the move. Or is that me? My busyness makes it difficult to contemplate Jesus and my life with him. On the left side of the illumination is a mysterious keyhole. Its placement seems worthy of taking the time to ponder. The key to the door may open us to the birth of the Christ Child. What else might the key unlock? During this Advent there is still time to look, listen and get in touch with his grace and truth and to find the gifts that Jesus brings into the world through his birth. Thank you, Lord, for coming. Thank you for sharing your flesh and blood. Help me to offer your love and compassion in this world. Unlock in me that which resists a more authentic relationship with you. Implant your Word on my heart. Amen. Gold upon gold shimmers throughout this illumination. God’s presence is in every fleck. When an artist applies gold leaf onto a page, one’s mere breath can send the gold flying in the atmosphere. In order to keep this precious material in place, windows and doors must be secured. No quick motions or unplanned actions can occur. The atmosphere must be regulated so that the gold does not dissipate. These demands of using gold may not seem compatible with our life, where changes abound. Twists and turns, depths and valleys are traveled year after year. Is gold compatible with our perception of Jesus? The illumination seems to be open, moving and incorporating the whole of the cosmos. Perhaps the pure gold of Jesus’ figure is meant to fly in a billion different directions in order to touch every person on earth. Jesus’ incarnation reflects his relationship with us. The micro specks of his golden presence abound in our lives every day and permeate our existence. We are part of him and he is part of us. The kingdom of God lives today, on earth, through us. Gold is everywhere. The Word is divine. Yet Jesus, the Word, also lived among us and was fully human. Like us, he experienced thoughts, feelings, loves and losses. He understands us. The Word continues today to echo and impact in our lives. Darkness may surround us and convince us this is our lot, yet Christ is still present. As his disciples, we can offer each other words of comfort and acts of mercy. We can visit the sick, the lonely, and those imprisoned by all sorts of darkness. We can offer a smile, a hug, a can of soup, a prayer or a note. What do you do best? Offer your gold. May we be comforted by the fact that Christ’s life and light will never abandon us. May we be the hands and feet and heart of Jesus in our communities. When darkness befalls us, let us be open to receive the light from each other. We are in this together. We can hold a candle in the darkness and be assured of an eternal source of fuel for the light. Let this week’s illumination enliven you as you claim the grace and receive the gold that is available as quickly as the flutter of a heartbeat. As you sit by the fire in adoration, may your spirit be rekindled during this amazingly warm season. Susie Kuszmar is a Marriage and Family Therapist with a Master of Arts degree in Adult Christian Community Development from Regis University in Denver, Colorado. She is a newly retired Mission Vice President from Saint Agnes Medical Center in Fresno, California and a very thankful wife, mother and grandmother. Have you ever needed something, but were too hard-headed or embarrassed to ask? This passage from Isaiah sets us up for that. Some context: the people of Judah were in trouble and their leader, King Ahaz, needed help to protect his people from forces who wanted to invade Jerusalem and replace him with a so called “puppet king”, thus destroying the Davidic lineage of which he was a part. Yet, Ahaz did not want to bother God. Have you ever felt that way—not wanting to be a burden but not knowing what to do otherwise? Ahaz did not want to test God. Ahaz was timid and lacking the faith that was demanded of him. Nevertheless, God had other things in mind, which he provided. By refusing God’s offer, Ahaz refuses to trust God. Through the prophet Isaiah, God offers a sign that lacks restrictions cf. verse 11. How awesome that we have this reading during the Advent Season when we recall “God with us”, and God’s promises of ongoing faithfulness to be with us are remembered. This text reminds us of faithful patience and of responding to unexpected help. There is a hopeful future in a leader whose vision and authority will shine as a message of hope. As we will pray throughout the week, this text beckons us to respond with trust to the gracious and unexpected presence of God. The words that I am holding are “shall grow.” As a whole, the passage contains comforting words to hear as our world is still healing from terrorism and acts of violence. In a season where the weather reminds us of our longings and the darkness we feel, this passage brings an energy and light that is needed so that we can “run forth to meet…Christ” (Collect, Advent I, Roman Missal). More so, it allows us to remember the importance of the season in preparation for Christmas. I appreciate the four titles attributed to the messiah, which are bold and yet soothing, timeless and yet looking forward. I wonder with curiosity what other names Isaiah would include—what about you? These titles highlight an anticipation in which our community can broach the fear of mystery that all Christians share as we wait for the Lord’s Second Coming. We are longing for the joyful moment, of loving communion with God. Further, these titles give a face to the invisible God. We can enter into this Year of Mercy, for in these titles we can claim that “Jesus Christ is the face of the Father’s mercy” (Misericordiae Vultus, 1). Advent is a season to remember God’s promises and to see those promises again with renewed eyes and faith. We know that Christ has come and will come again. I appreciate that we celebrate Advent with this reality, acknowledging that there is an “advent going on” in ourselves at all parts of the year. And so it leads us to a response of trust in the presence of God with us. We should ask ourselves whether or not our eyes are wide open, knowing that God is already in all things. When I asked God to open my eyes to the illumination, it was not toward a particular color or shape. Rather, the illumination evokes in me feelings of movement and energy, resembling the hustle and bustle of the red carpet of Hollywood, and triumphant sounds of trumpet blasts. You can almost hear Handel’s Messiah breaking through the ink and page. Humor me (and I mean this with all due respect), but it feels like a Tetris game meets Picasso as the pointed shapes and the circles fall into each other. Advent occurs when the weather is frigid, on the cusp of the tail end of the autumn season, when days are shorter and light is a true gift. This illumination is contrary to that—the messianic predictions create a movement of energy, of light and warmth. I enter into the Paschal Mystery because although the Advent liturgy is shaped by our longing and waiting, this illumination is an explosion of movement that alludes almost to the joy and excitement of Easter. The circles of gold, bordered by the various titles, to me, allude to the rose windows of old European cathedrals. These in turn echo intricate evergreens that shape advent wreaths, a home devotional that has found its way into liturgical communities. These beautiful circles of greenery give way to the progressively consuming light of candles, as the winter nights grow longer. The hints of blue all around allow me to celebrate God’s promise of mercy with Mary, one of the important Advent characters, whom God has chosen. Further, the blue brings me to a place of prayer by connecting with Mary’s Magnificat. And so in this promise of mercy to be with us, the gold throughout the illumination allows us to shout our praises that God is entering our world as we cry out, Maranatha! The first gift we were given besides our breath was our name. and to keep on asking you what we most desire. and the abiding peace, which you alone can fill for eternity. Anchor us with your love and grace in our moments of fragility. the refugee, the outcast, the lonely, the hopeless and the doubter. and we share in the foretaste of heavenly joy. aching for that bearer of hope and restorer of spirit. and be healing balm for our communities. who dreamed dreams and helped accomplish the plan of salvation. to continue sharing the love and presence you have promised. with hearts filled with the light that can bring peace. and through your many and holy names, now and forever. When I first gazed at this illumination, I had a negative reaction. I could not get a handle on what was going on because there was only so much that my eyes could take. As I prayed with the other movements, I shifted in my prayer. Contrary to the movement of energy and swiftness that occurred as I prayed during the week, the word that is now surfacing is “slowness.” This echoes back to the words I first chose in the process. Why slowness? The spirit guided me to think of the illumination as one in slow motion, like a “freeze frame.” I am given a glimpse into heavenly movements of praise and adulation syncopated with the “the beating heart of the gospel, which is mercy” (Misericordiae Vultus, 12). This illumination—what I thought was an obstacle to prayer—is actually one that brings forth the holy mystery of how time is but a human thought. In the midst of the illumination’s movement and holy chaos, the words of the prophet ring true and it settles me into what the prediction’s essence is about: God with us. Angels, I read, belong to nine different orders. Seraphs are the highest; they are aflame with love for God, and stand closer to him than the others. Seraphs love God…. The seraphs are born of a stream of fire issuing from under God’s throne. They are, according to Dionysius the Areopagite, “all wings,” having, as Isaiah notes, six wings apiece, two of which they fold over their eyes. Moving perpetually toward God they perpetually praise him, crying “Holy, Holy, Holy…. But according to some rabbinic writings, they can sing only the first “Holy” before the intensity of their love ignites them and dissolves them again, perpetually, into flames (Holy the Firm, Harper & Row, 1977). May we continue to seek God’s signs from this time and forevermore because the zeal of the Lord of hosts will do this. Where does this now bring me? This passage and illumination give me an opportunity to reflect on the anticipation that is building up within me: that Christ is being born in my everyday experience. It edges me toward this year of mercy where “we find proof [that] God loves us…and comes to our aid whenever we call” (Misericordiae Vultus, 14). One of my family traditions is the celebration of Misa de Gallo or Simbang Gabi—Mass in the night—a novena of Masses in the days preceding Christmas, originating from the Philippines. For nine days at 5 am, I approach the tables of Word and Sacrament to prepare my heart for the Christmas season. After each liturgy, with the assembly, I am sent forth spiritually nourished in order to greet the Advent morning complete with indigo hued sky, and barely awake drivers! This week, I prayed noticing the winter season in which Advent coincides. I look forward to continuing this Advent with the fullness of my being, where the night sky gives way to the sun with rays of hope. My prayer for you is this: let us not sit idly waiting, hoping, longing. We as the people of God need to move, and to do so with joy. May we find ways to shout that joy of “Mighty God” from the rooftops, or whisper “Prince of Peace” into the ears of a young one, or yet share the joy of “Wonderful Counselor”” with someone in need. Maranatha; let us dream together. John Michael Reyes is a Campus Minister at Santa Clara University. He received a Master of Divinity degree from the Graduate Theological Union (JST and FST). Prior to SCU, he worked as Liturgist and Chapel Coordinator at Seattle University. Additionally, in recent years, he has served as a liturgy coordinator for the annual Los Angeles Religious Education Congress. He hopes to be able to study at Saint John’s School of Theology and Seminary some day. This passage from Proverbs begins in the form of a poem. It is written in the voice of Wisdom, who is personified as a woman. The poem locates Wisdom’s presence with God both before and during the activity of creation. Though scholars are not in agreement about whether or not Wisdom represents the second person of the Trinity, the similarities are striking between the two. Additionally, there are quite a few parallels between this poem and the creation account in Genesis 1, in which “God saw everything that he had made, and indeed, it was very good” (Gen. 1:31). As Wisdom describes how she rejoices in creation, she also expresses a particular affinity for humanity. In the next line the passage switches into an instructional discourse; she addresses humanity as her children for whom her care is quite evident. The lyrical tone, archetypal imagery, and cosmic language are all literary devices used to attune the reader to the attractive nature of pursuing wisdom. The book of Proverbs juxtaposes the foolish choices one is free to make with sensible choices. This passage stays true to form and sets up the duality between life and death. If one hates wisdom, one is said to love death. Whoever finds wisdom has life in its fullness, which Christians now know to be communion with Jesus Christ, who is the eternal Word, Wisdom and Power of God. “I was daily his delight, rejoicing before him always, rejoicing in his inhabited world and delighting in the human race” (Prov. 8:30-31). So often I have fallen into the pitfall of conflating the Creator solely with the Father. Thus as I read Wisdom’s poetic narrative, Christ’s participation in creation—and his delight at that—struck me deeply! If Christ designs, creates, and delights in human beings, then what excuses do we possess to deny the goodness of humanity? What keeps us from rejoicing and delighting in the human race as well? How much longer will we refuse to see the beauty of Christ’s design in ourselves and in one another? This passage refutes a misconception I held at various points of my life that Jesus only begrudgingly became human out of sheer obedience to the Father to atone the sins of humanity. Alternatively, this poem gives me a glimpse into the divine blueprints in which the incarnation was not simply a backup plan after Adam and Even ruined it for the rest of us. Instead, Christ became human wholly out of love—the kind of love celebrates us as its recipient, not pities us. He became human not simply to fix our fatal mistakes, but to show us in the flesh that he is the Way to eternal life and encourage our participation in his divine plan. I can no longer downplay his humanity, nor wish to escape mine. Instead, I have a newfound reverence for Christ’s embodiment and my own. In this illumination, the fact that there are seven pillars indicates completion and perfection. Yet one of the pillars remains unfinished. The third pillar is missing its capital–the topmost part of the column. Instead of contradicting the significance of the number, however, I believe this is illustrative of the Christian paradox of what is already but not yet. Wisdom’s house is complete, but it is also still evolving as Wisdom extends her hospitality to persons of every time and place. Often the style and ornamentation used on a capital indicate when a column was built. The absence of the capital on the third pillar is a small detail but it acts as a significant gesture, inviting those who encounter the illumination to personalize it. Individuals reading The Saint John’s Bible may imagine how Wisdom’s house might look with stylistic contributions to the architecture that are representative of their historical and geographical location. As I gaze at the buildings, which are sprawled across the page, I imagine that they extend infinitely outward in every direction to accommodate all who heed the call of Wisdom. The spaciousness and span of the architecture showcase the design of the Creator. The fact that Wisdom’s house is not just one big open interior space reveals that diversity is part of the divine design. The many doors and rooms imply that the cultural contexts within which the pursuit of wisdom takes place are to be respected–not expected to conform to any one norm. Holy Wisdom, teach us to rejoice before the Lord as you do. Show us what steps we must take to be free from the pressures of the world that draw us away from you, from your path, from your way. Purify our hearts so that our eyes become set on you alone. Guide us to greater and lasting freedom so that we may choose to participate in the life you promise us freely. Grant us fresh lenses with which to view the world and humanity so that we, too, might delight in the Lord’s magnificent creation. This Advent, we incline our ears to you. We come before you, watching daily at your gates and waiting beside your doors. Equip us with your hospitable nature. And accompany us as we extend your invitation to all whom we encounter, in Jesus name. What does it mean to watch daily at Wisdom’s gates and wait beside her doors? I imagine it is a lot like spending time in contemplation. Poised at the edge of Wisdom’s house, I am removed from the noise of my surrounding area. But yet I am not fully inside her house. Trying to be attentive to the space in which I dwell, I pay no mind to the others who are passing nearby. Trying to be attentive to the presence of Wisdom, herself, I simultaneously try not to get hung up on every word she utters. Slowly she convinces me that I am not meant to grasp her words so firmly, but trust instead that they will settle as they are intended to settle. Finally, I let go. After exhausting myself by trying to strike the perfect balance on the many continuums involved here, I surrender nearly by default. This type of surrender is not something I conjure up; the more I try, the more I resist contemplation. Instead surrendering is like a free fall. Only then does Wisdom welcome me. Beginning from this disposition alone does Wisdom’s teaching find a home within me. As I surrender, Wisdom dances all around me. She writes her delights upon my heart. She carries my burdens, renews me, and gently awakens the insights I need for today. The pursuit of wisdom is a timeless endeavor. People of all times and cultures have sought after wisdom. To be wise allows one to live with understanding of one’s identity, to make sense of one’s circumstances, and to live in the world in a way that is life-giving and fruitful. While the outward manifestations of wisdom take many forms, wisdom itself is unchanging. Thus the Church invites us to stand on the foundation built by those who have sought the way of wisdom before us. Doing so allows us to embrace the security she provides. As the Church hoists us onto her pillars, we can radiate the light of Christ as the moon reflects the light of the sun. Many individuals long to walk in the way of insight but do not know where to begin or what that looks like. Christians who sit daily at the gates of the Lord become lights to those who are still finding their way. Wisdom says, “For whoever finds me finds life and obtains favor from the Lord” (Prov. 9:6). May we use our favor for the sake of drawing others into the great banquet Wisdom has prepared, so that all might know her, so that all might find life and live. May we, like Wisdom, be hospitable to all whom we encounter, truly rejoicing in the inhabited world and delighting in the human race. The Saint John’s Bible highlights many faces and voices of the marginalized and vulnerable, of those who often are overlooked in day to day life. These faces help us to remember, that it is the marginalized that Jesus often sought out. He healed them and restored them to their communities. As you pray with the faces in the illuminations, spend time reflecting together on who you are reminded of today that could use prayers. Teaching your children to pray for others helps them establish a pattern of noticing the needs of others as Jesus does. It begins to broaden their circle of awareness. A great way to initially pray for others is within your own family. In order to pray for your family member you must first listen to their needs and understand what to pray for. This is why it is an excellent opportunity to pray for each other after you check-in on your highs and lows. Once you hear in what way that person’s day did not go as well as it could have, you can pray focused on that topic. And then you can pray in a specific way in thanksgiving for the highlight of their day they mentioned. In the coming days, ask to see if anyone has noticed that the prayers for them have been answered. When they have you may practice offering prayers of gratitude and praise. Ask each member of the family to bring a magazine or newspaper article and/or photo of a current event. Invite each person to explain why they were drawn to the one they chose, how the event makes them feel, and offer a prayer for the persons and places effected. Show— Throughout the Bible, there are a vast array of emotions expressed as people cry out to God in varying circumstances. Identify some Bible verses that show the variety of ways people express their emotions to God. After you read each one, discuss which emotion(s) it expresses. You can also use the illuminations to discuss the emotions you see depicted in The Saint John’s Bible. Search for faces and identify the expressions you find. Brainstorm— Naming emotions can be difficult, it but can be more accessible if there is a list of emotions to reference. After discussing some of the emotions found in Scripture, spend time as a group thinking of as many emotions as you can. Write them down and leave room to add more as you think of them later. This list can be used each time you talk about feelings. Check-in and Share—Many families already have a system for checking in with one another such as having each individual share the highs and lows of their day. There are many names and versions of this, but the concept is to give every family member the opportunity to express something good and something less than desirable that occurred throughout their day. By doing this in the context of reading Scripture, the connection will be made that God cares for the whole person and all aspects of human life. Invite each member of the family to identify how each particular high and low made them feel, referring to the list of emotions when necessary. Today ____________ happened. Because of this, I feel ___________. Pray: Allow each person to have time to express how they are feeling in a prayer directly to God. This may be done out loud to the group or silently. You may also choose to spend time writing your own psalms. Conclude with petitions that arise from what has been shared or reread one of the Psalms you used. Depending on a person’s preferred learning style—auditory, visual, or kinesthetic—individuals might find affinities for different types of prayer. Consider what types of activities the members of your family prefer and make those a part of your prayer. Whether that be playing or making music inspired by the Word of God, listening to audio recordings of Scripture, singing, drawing your own interpretations of the Biblical scenes, writing and decorating the word you receive in lectio divina, or creating mini plays or skits, honor what you and your family members are naturally drawn to do. The Saint John’s Bible is undoubtedly brimming with creativity. After spending some time doing visio divina, you might be surprised by the ways in which you are learning God speaks to you—through colors, textures, lines, patterns, and so on. As you begin to trust what God is revealing through the work of the artists and calligraphers of The Saint John’s Bible, hopefully you will learn to trust the images that unfold internally within you, too. St. Ignatius of Loyola was a huge proponent of praying with one’s imagination, which is practiced by placing oneself in the scenes of Scripture. The idea is that once you read a Biblical text, you then begin to visualize what you heard, imagining where you are and who you are with. Next directing your attention to the details, you ask yourself what you see, hear, taste, touch, smell, and feel. This is a type of prayer that anyone can do at any age. Within our imaginations we can see, hear, and touch things in the scenes as if we were there. In this way, the living Word of God becomes personal. Designate someone to read the passage of your choosing. Then allow some quiet reflection time so that everyone can enter into their own imaginations and encounter God uniquely. You may find it helpful to prepare a list of basic questions for each person to have in front of them such as: What is around me? Who else is there? What do their faces look like? Are they happy? Sad? Angry? What emotions do I feel? What do I hear? Is anyone speaking to me? What are the smells? This could also be a great time to bring out any art or craft supplies, so that those who wish to draw or otherwise create what is in their imagination may do so. Invite each person to share about what he or she experienced. Conclude by reading the passage a final time. The Bible is a big book and sometimes we wonder where to begin. The Gospels are always a great place to start. They are often the most familiar to us. To narrow your focus, choose a theme (e.g. the miracles) and work your way through passages with that theme over the course of weeks or months. The miracles performed by Jesus in the New Testament offer us particular insight into who Jesus is. By reading about the many miracles, signs and wonders he performed, we come to know Jesus’ mission in which we are called to participate. These events reveal to us the will of the Father. To get started, here are printouts of three illuminations from The Saint John’s Bible showing miracles Jesus performed. Read each passage as a family, take some time to journal what you see in the illumination, then end with discussion. From week to week, center your discussion on the similarities and differences you notice about Jesus in each particular miracle. As you begin to incorporate Scripture into your home life, try adding it after a meal, as part of preparation for bedtime, or whenever your family is most likely to gather together already. Keep it short and simple. Write down Scripture verses on slips of paper and each day ask a different family member to draw a passage, find it in the Bible, and read it aloud. Make sure to include everyone. For those that are not able to read, pick one line from the passage you have read and ask them to repeat it back to you. End with a brief discussion. Equip your children by teaching them short verses from Scripture that can be quietly repeated over and over such as while brushing their teeth or if they awake in the middle of the night..
Use Bible quotes to help your children practice their handwriting. Once you have introduced Scripture into your daily routines, choose a consistent time that you will intentionally gather together for a longer reflection—perhaps one evening a month or a Saturday afternoon before a special family dinner. One aspect of these longer reflections will be to invite everyone to listen for a word that God has for them as the passage is read aloud. This word is something that everyone can carry with them throughout the rest of the week or month. Find creative ways to check back with your family members on how God continues to speak to them through their word. 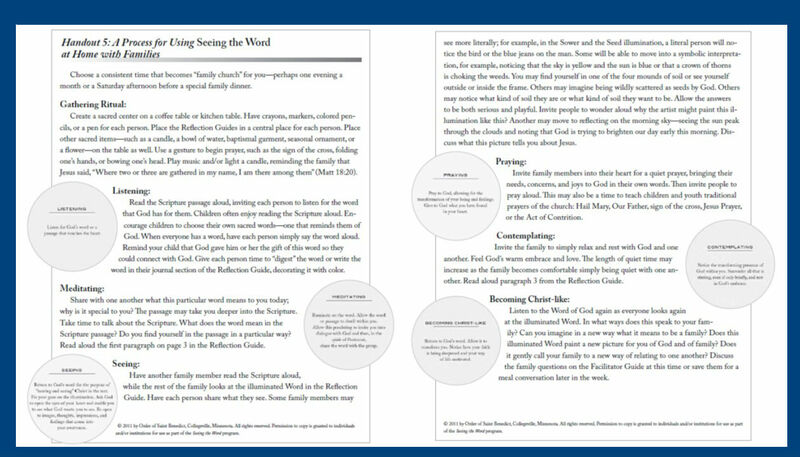 Barbara Sutton has designed the following resource, which describes the reflection process you can use with the Seeing the Word Reflection Guides in more detail.